Memorandum Jan. /'66 Tues. 23 Eugene helped clean wheat. I have went after a [?] 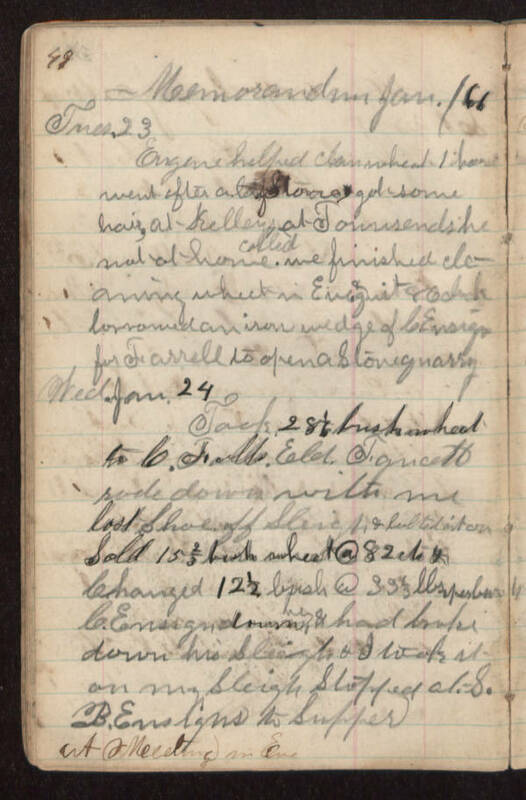 got some hair, at Kelley's, called at Townsends he not at home.We finished cleaning wheat in Eve & quit 8 oclock borrowed an iron wedge of C. Ensign for Farrell to open a stone quarry. Wed. Jan. 24 Took 28 1/2 bush wheat to C. Falls, Eld. Faucett rode down with me. lost shoe off sleigh & bolted it on. Sold 15 2/3 bush wheat @ 82 cts & Changed 12 1/2 bush @ 33 1/3 lbs. per bush C. Ensign down he had broke down his sleigh & took it on my sheigh. Stopped at S. B. Ensign's to supper at meeting in Eve.